You sell, they win. You’re an Impacter. Our goal has always been and still is helping people buy-sell easy on our no-meetup classifieds platform. 1, Sellers choose to add an “Impacter” badge to their listings in the feed. How do buyers know which items are for “impacter” (being sold for a cause) and which are “regular” Melltoo listings? All listings for “impacter” have a footprint icon on them. The beneficiary cause is also indicated in the item details screen. Can I choose which listings I want to #Resell4aCause? Yes! Before you submit a new listing for sale on the app, you will get the chance to select whether sale proceeds go entirely to you or if you want to donate sale proceeds to a cause of your choice. Can I change Impacter status after someone buys my item? In other words can I change my mind about donating sale proceeds after the sale has taken place? No, you may not. All impacter listings become definitive when a buyer places an order for that particular listing. This means you will not be able to change the impacter status. What are the different payment methods on Melltoo (and Melltoo Impacter)? You can pay for items you see on the Melltoo app with your Melltoo wallet. You will either pay with cash on delivery once the item is shipped to your address or a debit/credit card. You can use free credit from Melltoo as well for up a 50% discount on any item (300AED max per transaction). You can’t donate cash directly. If you wish to do so, please contact the charities directly. What Impacter does is transform your stuff into cash for a cause. After successfully selling your item, your newly available cash sale money will be transferred to the charity account you preselected. Can an “impacter” transaction get cancelled by admin? Unfortunately, yes. “Impacter” transactions are regular transactions on Melltoo. They’re subject to monitoring by our SAFE team and they may be cancelled if the either the buyer or the seller end the transaction before completion. Where can I see how much I’ve sold for a cause? You can check all your sales, both normal and Impacter sales, through your user profile. Do return fees apply to sales of “impacter” sales? All return rules apply to impacter transactions. In the event of a return, depending on the reasons, either buyers or sellers will incur a return fee if applicable. How do I track my return shipment? Depending on the company that is delivering your item (you’ll receive order details confirmation once the shipment is booked). Every time you successfully sell a new item that is marked for “impacter”, you receive impacter credit. In the near future, Impacter credit can be redeemed for freebies provided by our partners. Will I be recognized for donating money through Impacter? Every 4 months, we will publish a report on all donations made through the Melltoo app and the recipient charities. Melltoo usernames will be published along with the corresponding amounts contributed. Can I make anonymous donations? If users choose to remain anonymous, we will not share their personal details, we will share however their Melltoo username, as it appears on the app, in our quarterly reports (publicly available). Is my item safe during shipment? Melltoo’s Pay&Ship guarantees that once goods are shipped through us, they will get to the customer and the seller will be paid. As long as items are properly packaged, any damaged incurred during shipping will be covered by the couriers. All of Melltoo Impacter partners are registered charities in the UAE. Melltoo has a government-issued license through each partner to collect funds on their behalf in the UAE. Please click here for an updated list of our partner registered charities. Emirates Red Crescent is the local UAE branch of The International Federation of Red Cross and Red Crescent Societies (IFRC). They fund medical and disaster relief missions in the UAE and around the world. Salma Aid is a local UAE charity founded by His Highness Sheikh Mohammed bin Rashid Al Maktoum, Vice-President and Prime Minister of the United Arab Emirates and Ruler of Dubai. Salma funds food relief efforts for refugees and misplaced populations in distress areas. Friends of Cancer Patients in a local UAE-based charity founded by Her Highness Sheikha Jawaher Bint Mohammed Al Qasimi, Wife to the Ruler of Sharjah-UAE and International Ambassador of the World Cancer Declaration for Union for International Cancer Control (UICC). FoCP is committed to helping cancer patients and their families get through the long and arduous journey of cancer treatment through both moral and financial support of patients and their families irrespective of nationality, gender, age, religion or ethnicity. The last month has not been easy. A series of hurricanes devastated many cities in the Caribbean as well as mainland America. Flooding in India, Nepal and Bangladesh killed nearly 1,200 people and shut down thousands of schools. Wildfires raged through deforested lands, destroying homes and people’s livelihoods on their way. Scientists and nearly everyone in the business community recognize these events as partially caused by climate change and the impact of overproduction on our planet. We, Melltoo, recognize that mass production drives people to consume more and burn up more gases to produce enough energy for our needs. All of this mass consumption is a primary cause of unseasonal weather, deforestation, droughts and flooding. After all, if we’re burning fuel, fracking, cutting and over-cultivating, new strange events will happen. We launched Impacter because of our belief that selling second hand can play a powerful part in helping reduce overconsumption. We want to add a third “R” to the 3Rs, reduce, reuse, recycle and RESELL. We want to stand for responsible consumerism. We want to stand for responsible business. Since day one, our goal has always been to give our users the best classifieds experience ever. We facilitate their buying, selling, shipping and payment all in one app. The Impacter initiative is our effort to approach a 7-star customer experience, where every member of the Melltoo community is not only a responsible consumer but ultimately an Impacter. Impacter was launched on Android and iOS apps in October 2017. Impacter helps our community #Resell4aCause. 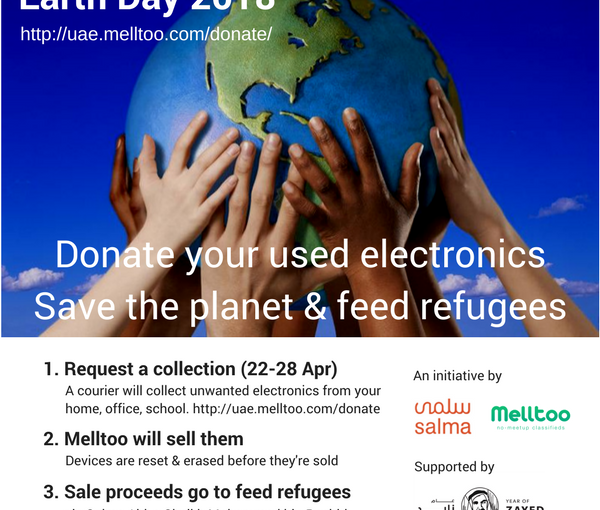 Instead of hoarding stuff in your closet that you don’t use, simply list them for sale on Melltoo, turn them into cash that goes to support a cause you select. Impacter means that selling used items can be a force for good not only by reducing waste but also by giving back to social causes. The idea has been cooking slowly through several iterations since last Spring and it truly reflects the ideals and values that Melltoo holds dearly. They are the same values of trust and no-waste (we’re the no-meetup classifieds after all!) that have guided our business since the beginning. For our users, it’s quite simple. User “Maryam” sells for a cause because it just makes sense. 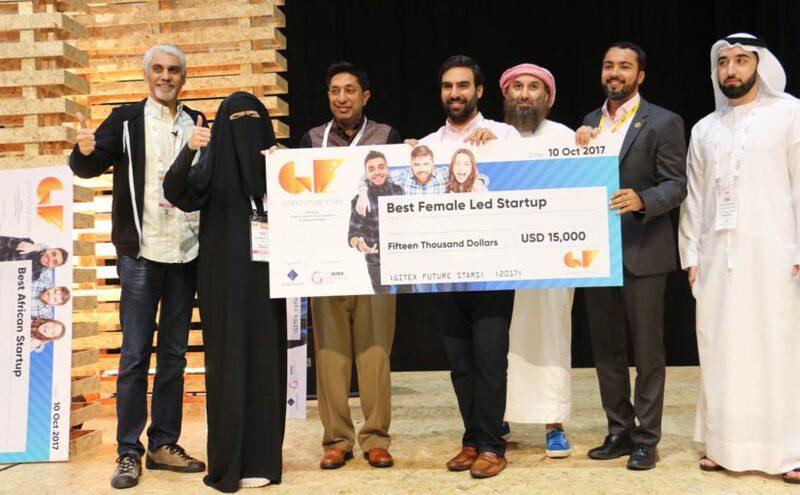 We would like to celebrate with you our win at the GITEX 2017 Supernova Competition in the category of “Best Female-Led Startup”. Watch our COO, Sharene Lee’s, pitch. Culture contributes to team synergy and is a key factor to our success as a company. We have blogged previously about our culture of collaboration, team spirit and the unique remote work format that we have developed over the years. that all have allowed Melltoo to thrive as a technology resources and allocate resources to technology to develop Pay&Ship or completely revamp or post flow and our search flow. We’re packing a new technology within the new release of the app that will even unlock the monetary value of secondhand items in the local economy. As a mission-driven company, we take pride in not only providing bug-free technology for our users, but also empower them through this technology to use their newly earned money for social good. We’re also glad to announce our participation to the Create @ Alibaba Cloud competition in Shanghai this October 2017! More details about the competition. 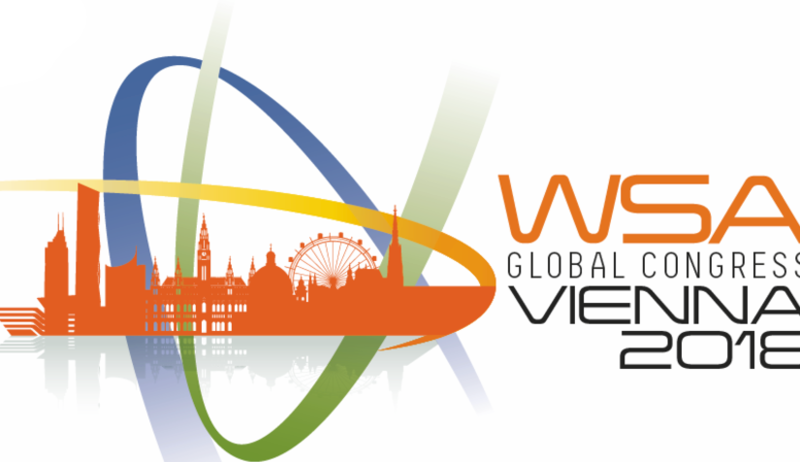 Melltoo Marketplace will be present at the World Summit Awards in Vienna in March in 2018 to unveil our newest product feature to date: Melltoo (Social) Impacter. The World Summit Wards reunites global businesses from the world over who are leaders in their own fields in several categories such as government and citizen engagement (Melltoo is nominated for this category), green energy, commerce, culture and a myriad of other specializations. Find out more here. Melltoo will join the ranks of regional and world-famous products such as Angry Birds and Anghami. We look forward to effectively transform community e-commerce for social good in the UAE. Melltoo Social Impacter is a new feature embedded into the Melltoo app that allows Mellsters to buy and sell for a cause. Like we did with online secondhand commerce, our job is to reduce friction for both donors and charities. We transform in-kind contributions to cash that is easily, cheaply and transparently transferred to charities in the UAE of the seller’s choice. In the process, we unlock the value of “stuff” that sits in drawers and storage rooms across the country, simultaneously combatting overproduction while giving back to social causes. The idea and passion behind Melltoo impacter stems from our business and our team’s core beliefs in the values of efficiency through an A-Z e-commerce approach to classifieds sales and sustainability through conscionable consumerism. Every day, Melltoo users decide to sell their secondhand items instead of disposing them into increasing unmanageable landfills. For more information about Melltoo impacter, sign up for our blog newsletter and social media (Facebook, Twitter and LinkedIn). When we first started Melltoo, we started with scratching an itch, solving a pain point that we personally had, the terrible user experience of classifieds. Deep down, classifieds appealed to us on an emotional level because it encompasses several of our personal convictions. We, as the human race, should not waste the precious resources we have been given by our creator. Classifieds is the key to resale and reuse. We believe in community and the need to strengthen its bonds across social, economic, and cultural divides. Classifieds allows participation by all segments of the community. Along the startup journey, as we busily grew the company from 2 to 25, we lost sight of some of the ideals that guided us in the first place. So over the last several weeks, we did some soul-searching in an effort to define our “raison d’etre” as a company. This is our we’ve come up with. To change the way we consume things to enable society to strike a balance between consumerism and sustainability. To advocate for responsible consumerism through resale and reuse and to fight the disease of inaction. Great leaps forward begin with small steps. The preservation of our only planet is the business of all and not the few. The only way to achieve this mission is to get the masses involved and the only way to get the masses involved is to make it easy for them to get involved. Hence, our mission is to make buying and selling preowned goods so easy it becomes an enjoyable and rewarding part of everyday life, enabling everyone to do their part in building a more sustainable society. People before technology = As technology becomes a mediator between people, we must not regard technological advancement as superior to human advancement. Technology exists to serve people. Peer2peer = a marketplace for mass participation where buyers are sellers and sellers are buyers. As we look ahead in building the region’s foremost peer2peer marketplace, we will take our vision, mission, and values as guideposts along the way. Not so long ago, we published our manifesto to our users, readers and the startup community. It has taken us three years to figure out how to communicate the vision and passion that have been the driving force behind our business and work culture. Aa a peer2peer classifieds business, we have empowered thousands of individuals in the UAE to sell among one another, reuse, resell, make some money, save some money and conserve our planet’s resources. Mellsters love a good deal and love to make some money off their old stuff. However, that’s not the only reason they buy and sell secondhand, they do it because they want to conserve our only planet. Every effort in extending the life cycle of a product contributes to extending the life cycle of our planet. Sustainability is often an abstract notion for many people, but what is really? It is the notion that we ought to preserve the resources on earth and in our words “strike a balance” between the need or the urge to consume and its consequences on the planet. Let’s take cotton, a major component in clothing and apparel. Fast fashion trends in recent years have accelerated the consumption of clothing as people continuously add to their wardrobes in an effort to keep up. While consumption is good for the economy, it comes at a cost. Cotton products exhaust our water resources. Water is long thought of as a renewable resource, but with decades of droughts in different parts of the world, this no longer seems to be true. Add to this the effect of industrial polution and it’s no longer clear how renewable our water really is. Additionally, many security organizations now say that water has become a major security concern. Therefore, water (or lack of thereof) are potential sources of conflicts in the near future (think of the Nile dam tension in Eastern Africa). Twenty thousand liters are spent to produce 1kg of cotton ergo one t-shirt. If 20,000 displaced refugees had a liter of water every time we produce a new t-shirt, the world would be a better place today. We would be able to save lives instead of producing more t-shirts that will eventually end in garbage bins and landfills. Market forces ensure that basic cotton t-shirts do not sell for more than 5 dollars a piece. A major department store would typically pay between 1 to 2 dollars to a factory in Bangladesh for a T-shirt. The 2 dollars would be spread between overhead and labor costs. The Bangladeshi factory worker typically receive cents for their labor. Mass production and the economics of t-shirts encourage wage stagnation in manufacturing countries. These laws and regulations are often proctored and protected by the government in many countries. We do not want to be part of the problem. Waste management is a significant financial and environmental problem in many countries. UAE is not an exception. While the UAE recycles only 25% of its waste, we should aim higher. Electronics have become a major source of waste with new editions of different devices released every year. Technology changes rapidly and things become obsolete in a matter of months. In the age of the new normal, people prefer to pay up the price difference for a new device rather than get stuck with an old design. TV’s, mobile devices, PC’s all need to be recycled. eWaste is an ever-growing problem because electronic products consist many non-renewable resources, the most important being metals. Once extracted from the earth, metal doesn’t grow back. In addition, if not properly handled, eWaste is toxic and pollutes, affecting communities in developing nations such as India and China where waste from developed nations are often exported. The UAE is making it easier to recycle e-waste. Thanks to an assisted UN project and an investment of about US$200 million, the UAE plans to install 8 recycling centers for e-waste across the nation. E-waste management is not just a tedious duty to save the environment but rather a profitable economic opportunity since metals can be extracted from discarded electronics, then reused and resold instead of newly mined. The region is also coming together with a colossal investment in Masdar city and waste management companies such as Ecyclex. Masdar City’s annual Abu Dhabi Sustainability Week bring world leaders and businesses around sustainability. Splash, one of the region’s major department stores, is leading the initiative and collecting used items for reuse at their stores. Reduce. Reuse. Recycle. These are the 3 R’s of the environment. Let’s add one more, Resell. Reduce consumption where possible and don’t buy things you don’t need. This will help your pocket as well. Another way to reduce consumption is to buy used or secondhand. If you have to buy something, make the responsible choice and buy secondhand where possible. Certain products like furniture are often discarded before their time. A family that is leaving Dubai generally doesn’t have the luxury of taking their furniture with them and storage is too costly. Resell and reuse. Reusing something extends a product’s lifecycle and reduces the need to produce a replacement unit, thereby preserving the earth’s resources. Reselling stuff also aids the class of economic participants who cannot to afford to buy certain products new. Giving them access to high quality products at lower prices reduces the production of cheaper alternatives that get trashed far more quickly due to poor quality. Finally, recycle. Many of the resources we need are trapped in products that are simply buried in landfills because they weren’t recycled. There are recycling bins all over the UAE, do your part. Join the movement. Anything you do helps. A small group of environmentalists doing everything is not going to make a difference. We need everyone to do just one small thing and THAT will make a huge difference. Going green is not about doing everything, it’s about doing something. Help us make our planet and our economy more durable and more sustainable. Resell and reuse and make an impact on the planet today. When we first launched Melltoo in 2014, we saw ourselves as classifieds on mobile. Everything was moving to mobile, except classifieds. Online classifieds were still just electronic notice boards. We saw the opportunity to bring classifieds into the post-smartphone era and to take advantage of hardware capabilities like geolocalization, instant messaging, and push notifications. The rise of social networks also brought about a paradigm-shift, every product became social, so why not social classifieds? To be clear, we didn’t pick classifieds from a long list of industries needing disruption after, classifieds has always been in the blood of the founders. Morrad Irsane, co-founder and CEO of Melltoo grew up around buying and selling second-hand. While raising a family of 13 children in France, Morrad’s mother regularly re-used clothes and hand-me-downs were standard. During their annual summer break in Algeria, she had a thriving side business reselling clothing she collected from France.When Morrad invested his savings to launch Melltoo in 2014, he was reviving an old family tradition. Morrad envisioned a mobile app he could take with him anywhere, with a built-in chat so he would never miss a deal. As with all first-time founders, we thought that we would build it and they would come. Launch an app and everyone would use it. We were wrong. While we grew in our first year, it was a struggle. We had to get creative. We experimented with many different user acquisition models, content marketing, social media, app store optimization, SEO, spamming, even offline events. Name it, we’ve probably done it. In fact, our downloads were healthy with over 500 new users daily with almost no marketing spend. While our first iteration was not a huge success, it gave us plenty of opportunity to talk to our users and this is what we discovered. When someone says this, it isn’t because he doesn’t have something to sell, it’s because he doesn’t want to sell his stuff. Search a bit more and you’ll discover that what he’s really saying is: “I don’t need the money so I don’t want the hassle of selling my stuff.” Yes, selling via traditional classifieds is a hassle. In some cases, it’s downright torture. The main problem is meetups. List something for sale, get a bunch of phone calls from strangers at all times of the day and night, get lowball offers and then take time out to meet with multiple buyers before one finally buys (or not). If you don’t need to, why would you? Web classifieds are no-man’s land. Anything goes. List something for sale and get an offer from the wife of the ex-president of some unknown country on a continent halfway around the world. People ask you to ship them stuff cash on delivery. You get spammed. Who do you trust, who can you trust? Lesson 1: Peruse the startup literature and it is littered with the idea that founders must be “obsessed with the product.” There is no doubt that a great product is important, but a great product that nobody uses is still a flop. It is much more useful to be obsessed with the customer. Lesson 2: 2-sided marketplaces are among the most difficult businesses to build. You need buyers and sellers, but buyers don’t go where there are no sellers and sellers won’t go where there are no buyers. What do you do? Armed with this knowledge, we began to realize that classifieds didn’t simply need to be moved from web to mobile and the problem wasn’t one of technology and UI/UX. The problem was that classifieds was broken. People have stopped trusting classifieds and hate the hassle involved. They use it only when necessary, which meant when selling a used car or home and large items that needed to be disposed of, such as furniture. Anything less was simply not worth it. And just like that, we saw an opportunity to re-imagine classifieds, no-meetup classifieds.